A.S.W. 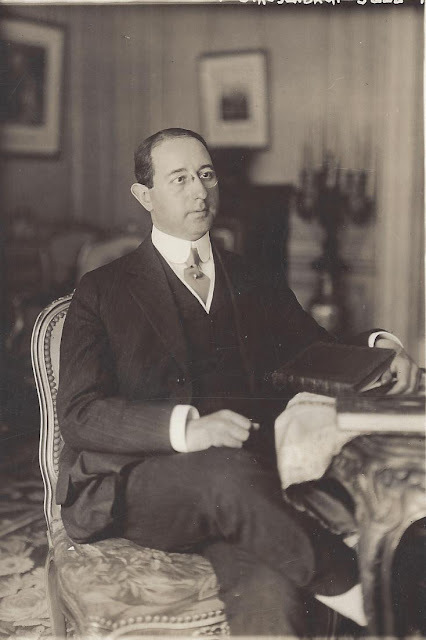 Rosenbach (1876-1952), legendary bookseller and collector, was a media darling in an age when important sales of rare books and manuscripts featured prominently in the news. These three original news service photographs in my collection span the prime of his career from the early 1920s to the late 1940s. A photograph may not always be worth the thousand proverbial words but it certainly can add an immediacy and texture to a collection not found on the written page. The stories behind each photograph are given below. The one thread that I found intriguing in all the original news wire descriptions was the emphasis on Rosenbach as a "collector" as much as a dealer in the eyes of the media-- even though it was obvious he was buying items for clients. Rosenbach cultivated this image as a collector but it was no marketing mirage. He salted away many items that he couldn't resist, showing them off to visitors while alive, and left behind the fine Rosenbach Museum holdings in Philadelphia are a testament to his acumen. Rosenbach in 1921 entering his prime. He had just arrived back home after dominating the Christie Miller Library auction at Sotheby’s London where “[Henry] Huntington’s money and Dr. R.’s aplomb swept all before them. . . Lot after lot was offered; with boring consistency, no matter what others bid, the Doctor bid a little higher” (Wolf & Fleming Rosenbach). He also had strong bids from Henry Folger. Now that makes for a happy bookman. 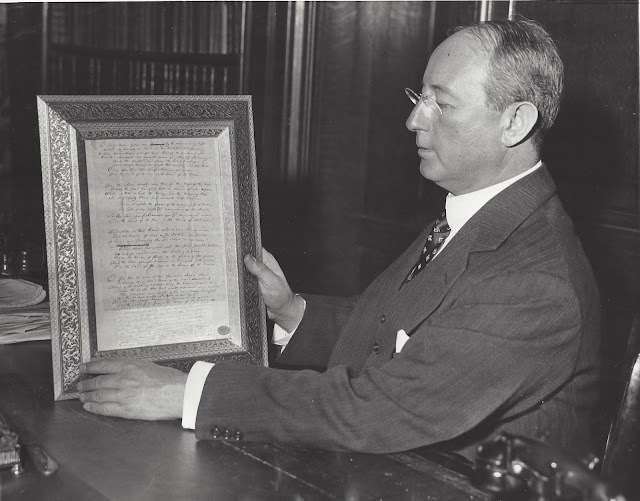 Rosenbach in 1934 posing with the earliest draft of Francis Scott Key's "The Star-Spangled Banner" shortly after his victorious $24,000 auction bid. The auction was highly publicized and competition was unexpectedly fierce but Rosenbach had an ace in the hole. The manuscript came from the collection of Henry Walters. Walters had intended it as a bequest to the City of Baltimore where it would be housed in a permanent shrine. Because of estate complications the manuscript had to be offered at public sale. Behind the scenes maneuvering took place and Rosenbach represented the Walters estate at the auction with basically an unlimited bid. Nice publicity for Rosy, happy estate, and a key document in American history placed in a proper home. See Wolf & Fleming for more details. 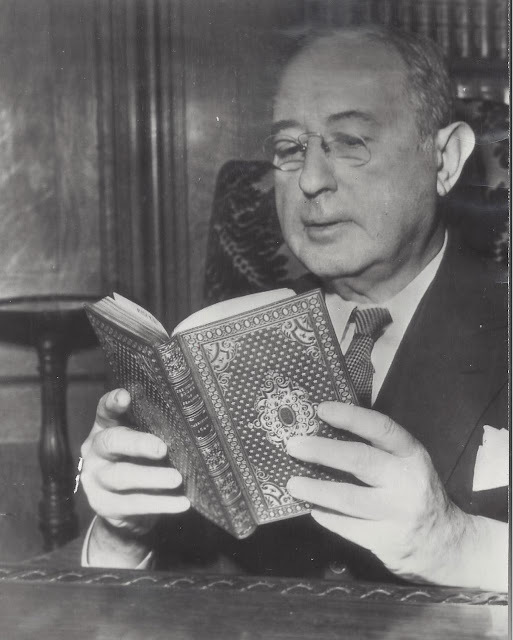 Rosenbach in 1947 examining his purchase of a copy of the first book printed in North America, "The Bay Psalm Book," published in Cambridge in 1640. The winning bid of $151,000 was the highest ever paid for a book in the U.S. This example is the famous Crowninshield-Stevens-Brinley-Vanderbuilt-Whitney copy. Wolf & Fleming in Rosenbach devote a lengthy section to the purchase of the book by Rosenbach and its subsequent sale to Yale University. This was one of Rosenbach’s greatest individual purchases but it was also one of his biggest financial boondoggles with a complicated thread of claims, counter-claims, and bad blood with Yale related to pre-auction fundraising; the end result being the Rosenbach firm lost $45,900 on the transaction. I think he must have been the model for Charles Essenheim in J. S. Fletcher's The Yorkshire Moorland Mystery (1930).